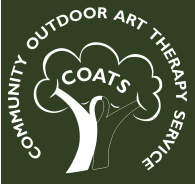 The aim of COATS is to integrate ecotherapy and art therapy concepts to provide therapeutic and social engagement that empowers participants through self expression using natural materials and their relationship to the natural world. Our intention is to promote and integrate the mental and physical wellbeing of group participants. Engendering emotional growth through social interaction can be aided by a shared experience – through art making and engaging with nature. Additionally, the sharing of nature and artistic expression is not constricted by social or cultural identity.